PETALING JAYA: For Datuk Robin Tan, taking over as interim chairman of the Berjaya Corp Bhd (BCorp) from his father Tan Sri Vincent Tan is a moment filled with nostalgia. He added that his father wanted to focus on the spiritual side of life and corporate social responsibility (CSR) commitments. Tan, who controls the Berjaya empire, called it a day as chairman of BCorp which he founded nearly three decades ago and appointed Robin, who is his eldest son, as the interim chairman as of yesterday. 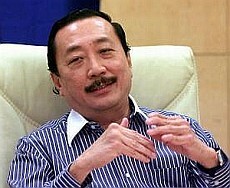 Tan - whose wealth is worth US$1.2bil (RM3.6bil) according to the Forbes magazine - is founder and controlling shareholder of BCorp, which is the flagship of the Berjaya group of companies. This self-made billionaire, who turned 60 yesterday, had in January last year handed the reins of his vast empire to Robin. Although Tan is retiring as chairman, he said:“I am and will remain the controlling shareholder of BCorp and my commitment to the group will always be 100%. I have left the day to day management of BCorp to my eldest son who is a very able and committed CEO and my second son Rayvin, who is an executive director, and not forgetting the rest of the BCorp directors who are also professional and efficient managers. The board, said Robin, would identify a suitable candidate to take over as chairman. Tan has been in the limelight recently for he is the only Malaysian to hold a 3.5% stake in Facebook, which is en route for an initial public offering either on the New York Stock Exchange or Nasdaq. Tan added that the Berjaya Group had contributed to the economy and the community through various business and CSR programmes. “However, I feel more must be done in the CSR area and my giving up of the chairmanship and day-to-day involvement with the Berjaya group's business will allow me to devote more of my time and energy to promoting more charitable and social programmes and initiatives,” he said. Robin, 37, graduated with a Bachelor of Social Science degree in Accounting/Law from the University of Southampton, United Kingdom. He joined the group in 1995 as an executive and rose through the ranks to become general manager of corporate affairs two years later. 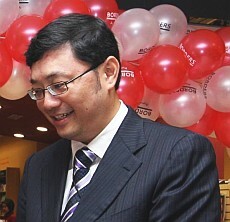 He was appointed as an executive director of Berjaya Group in December 1997 until his resignation in September 2001. Robin returned to the business and was appointed as an executive director of BCorp on Dec 21, 2006. He is CEO of Berjaya Sports, executive director of Sports Toto Malaysia Sdn Bhd and chairman of Berjaya Media Bhd, Berjaya Food Bhd and Sun Media Corp Sdn Bhd. He is also director of Berjaya Hills Bhd, Berjaya Sompo Insurance Bhd, KDE Recreation Bhd and Berjaya Golf Resort Bhd. One of his favourite pastimes is playing basketball.